June 11, 2015 -- In drag racing, the importance of consistency cannot be overstated. 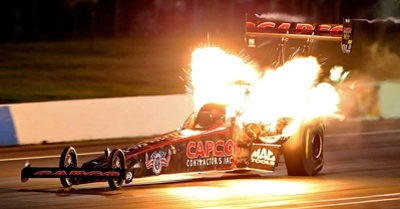 It is what separates the magnificent from the mediocre but, as Texan Steve Torrence has learned the past two seasons, it is no guarantee of success. Consider last week’s NHRA event at Englishtown, N.J.
Top Fuel point leader Antron Brown got his car down the racetrack, under power, on every attempt, a rarity on a tricky new surface at Old Bridge Township Raceway Park. It took him an average of 3.794 seconds to cover the 1,000 foot course, start to finish. Not surprisingly, he won the race. Torrence, on the other hand, got his Capco Contractors hybrid down the course on every run and did it almost as well as Brown. His average was 3.795 seconds. His reward? A first round loss that sends him into this week’s third annual Auto-Plus New England Nationals languishing outside the Top 10 for the first time in more than a year. Getting back to the business of winning rounds won’t be easy on a track on which the 32-year-old cancer survivor has yet to see a win light. Nevertheless, he remains optimistic, confident that at some point the pendulum will swing the other direction as he tries to fight his way back into contention for the $500,000 Mello Yello Championship for which he finished sixth a year ago. Despite recent results, Torrence obviously knows how to win. He was the NHRA World Champion in the Top Alcohol Dragster division in 2005 and, along with his four Top Fuel wins, he’s been the Top Fuel runner-up the last two seasons at the Chevrolet U.S. Nationals in Indianapolis, Ind., the world’s oldest, largest and most prestigious drag race.